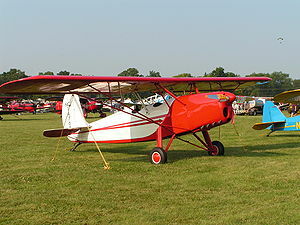 The Fairchild 22 Model C7 was an American two-seat touring or training monoplane designed and built by Kreider-Reisner division of the Fairchild Aircraft Corporation at Hagerstown, Maryland. Powered by a 95hp Cirrus Hi-Drive 4-cylinder inverted inline piston engine (58 built). Powered by a 125hp Menasco C-4 Pirate 4-cylinder inverted inline piston engine (8 built). Powered by a 90hp Wright Gipsy 4-cylinder upright inline piston engine (1 C-7C and 22 C-7D built). Powered by a 125hp Warner Scarab 7-cylinder radial piston engine (11 built). Powered by a 145hp Warner Super Scarab 7-cylinder radial piston engine (9 built). Aerobatic version, powered by a 145hp Warner Super Scarab 7-cylinder radial piston engine (6 built). Military designation for one Scarab powered Model 22 impressed into service and used by NACA.